Online casino software developer Playtech released a range of slots from the Marvel Comic book series back in 2009 and they were instantly a hit with players. 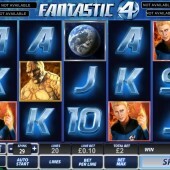 One of the stand-out games in the range is Fantastic Four which is a great balance of comic animation and decent wins. And if you're coming fresh to the game rather the lacklustre Hollywood adaptations, you're in for something of a treat. 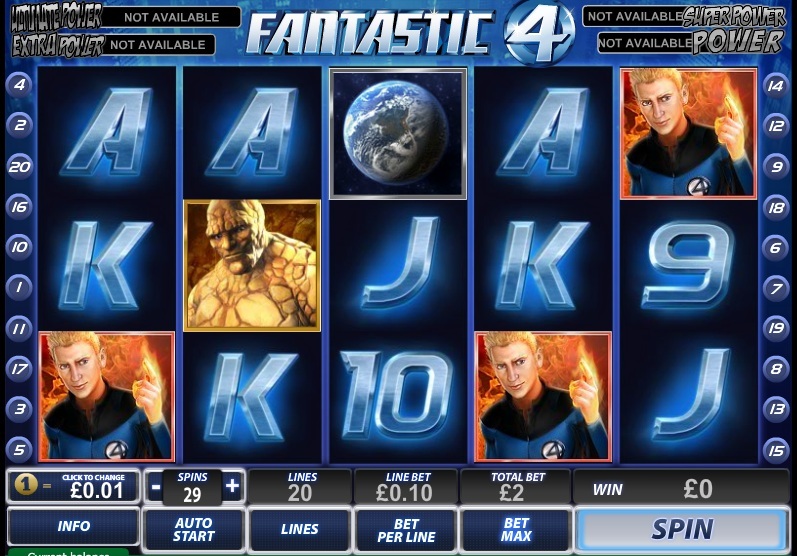 The slot plays across 20 paylines and five reels and features the four recognisable comic book characters: Mr Fantastic, the Invisible Woman, Thing and the Human Touch. The big draw to Fantastic Four, which can be a bit lacking in other Marvel Slots, is the bonus round. This is triggered when you get 3 or more scatters on any reel and awards you with 12 free spins straight away. During the bonus round you want all three blocks on the middle reel to fill up with one of the characters. If this happens you instantly win an extra 3-4 spins and you will also get a bonus during those extra free spins depending on the character. You might get extra multipliers, sticky wilds, expanding wilds or even wild reels if that character re-appears at any time during those extra free spins. This can be a hugely exciting and rewarding bonus round. While the game may not quite reach the heights of other Marvel online slots like The Incredible Hulk or Iron Man 2 but it's definitely one for the fans of comic books. Watch the Playtech Marvel slot video I have prepared to understand how the bonus is activated and how each character rewards you. Read more about this slot on the tab marked 'Review'.